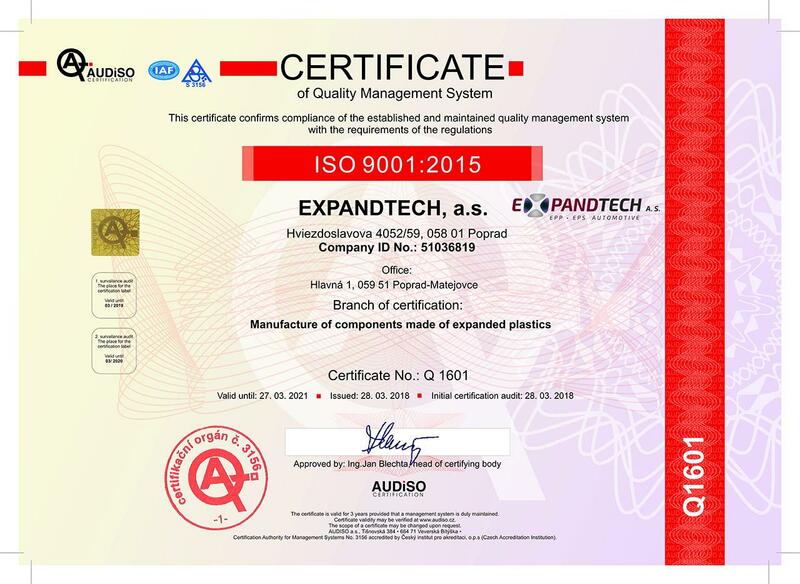 Expandtech a.s.’ production line operates under a well-established quality management system. The company obtained the international standard certification ISO 9001:2005 in 2009. While working closely with the automotive industry we keep improving the quality of our products. Meeting our clients´ needs is a priority. We act in accordance with the quality management system requirements of the international standard ISO TS 16 949. We make sure our suppliers fulfill our high requirements. Only accredited laboratories work with us on quality assurance. When manufacturing our products, we always focus on the efficient reusing of resources and energy recycling. We are fully aware of the necessity to protect the environment. Our production process follows all the laws and regulations concerning environmental issues. We maintain full compliance with environmental laws and regulations. We use energy resources with a lesser impact on the environment. We try to reduce the level of emissions, waste and any products that have a negative impact on the environment.